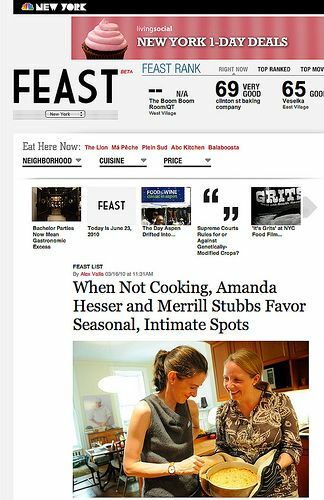 FEAST | Where do Amanda and Merrill Eat When Not Cooking at Home? "It's time for Feast Lists, these two courtesy of food mavens Amanda Hesser and Merrill Stubbs. Together, Hesser and Stubbs founded the cooking and social networking site Food52. Separately, Hesser, the former Times food editor who profiled Julie Powell's Julia Child project, publishes The Essential New York Times Cookbook (with recipes dating back to the 1850s) next fall. Stubbs worked the test kitchen at Cooks Illustrated and now writes for Edible Brooklyn and others. Hesser leans towards seasonal Italian, while Stubbs stops in three boroughs for her picks."